A dismal earnings report exacerbated the company's year-to-date slide. 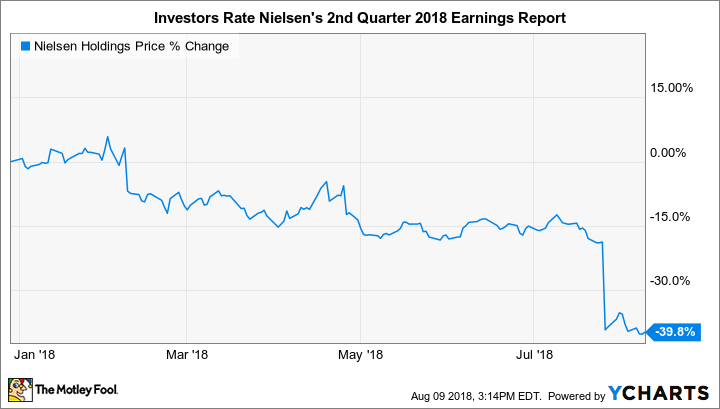 Shares of information-measurement giant Nielsen Holdings plc (NYSE:NLSN) slumped 23.8% during July, according to data from S&P Global Market Intelligence . Investors were further unsettled by the announcement that current CEO Mitch Barns will retire at the end of 2018. The company also revealed that it's now conducting a strategic review of its underperforming buy segment. Typically, a strategic review can result in further restructuring of a troubled unit, drastic downsizing, or in many cases, an outright sale. During the second quarter, $55 million of the company's $65 million restructuring-charge tally was attributed to the buy business, which sells analytics and market research information as opposed to the company's watch division, which houses its better-known audience-measurement services. Selling the buy segment may be a prudent course of action. In the second quarter, buy revenue declined 4% year over year, to $789 million, and the division generated an operating loss of $3 million. In comparison, watch revenue improved by 4.5%, to $858 million, while operating profit increased 4%, to $256 million. A sale or spinoff of the buy segment would cut Nielsen's annual top line almost in half, but the remaining watch business might be easier for management to improve through a tighter focus -- ultimately increasing shareholder value. Nielsen slashed its full-year guidance alongside second-quarter earnings. Revenue is now expected to improve just 1% in 2018 from a previous target of 3%. Free cash flow has been trimmed from approximately $800 million to a band of $550 million to $575 million. Finally, earnings per share, which were previously forecast in a range of $1.50 to $1.56, are now anticipated to land between $0.95 and $1.00 for the year. The sober revisions have only heightened investors' concerns. Nielsen is next scheduled to report in late October.